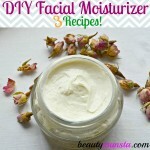 DIY Non-Greasy Shea Butter Lotion Recipe - beautymunsta - free natural beauty hacks and more! 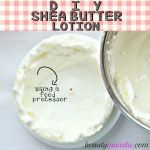 I have combination skin (slightly acne prone) and much as I love a good thick lotion to nourish the drier areas of my skin, I prefer making this easy non-greasy Shea butter lotion recipe for the summer months. It has a light consistency, is easily absorbable and doesn’t make my skin appear greasy! This recipe contains two skin healing oils and one immensely beneficial essential oil that is known to promote glowing skin and fade away dark spots. Find out more in my ingredient profile below! I’ve used sweet almond oil and apricot kernel oil, which are two light oils that are easily absorbed into the skin. 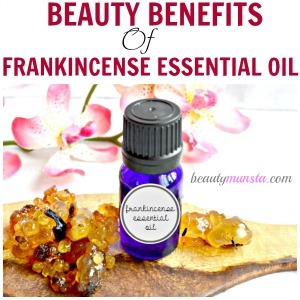 For a beautiful scent, I chose frankincense essential oil – it’s one of my favorite essential oils and has lots of beauty benefits as you can see here. Feel free to substitute frankincense essential oil with any other of your preferred essential oils. Don’t know what essential oils blend well with shea butter? 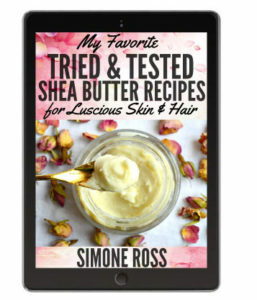 Click here to read my shea butter and essential oils guide! Note: Please use organic ingredients when making this non-greasy Shea butter lotion to prolong its shelf life. ➝ Sweet Almond Oil – Sweet almond oil has a thin consistency and moisturizes the skin without leaving an oily residue. If you have combination skin, sweet almond oil is perfect for softening and lubricating the chapped areas of your face while gently cleansing the oily areas. ➝ Apricot Kernel Oil – A very good source of Vitamin E, apricot kernel oil feeds your skin while protecting it from inflammation and harsh elements that can rob skin of its original luster. ➝ Lavender Hydrosol – A cooling and soothing aromatic water, lavender hydrosol calms irritated skin and rejuvenates it. ➝ Frankincense Essential Oil – This sacred essential oil is known for its potent anti-scarring properties that are effective in healing acne scars, old wound scars and stretch marks. It also has anti bacterial properties that shield that skin from germs that can cause infection. 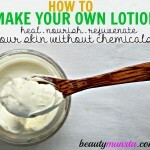 Frankincense essential oil also acts as a preservative in this shea butter lotion recipe. ➝ Cornstarch – Cornstarch has amazing moisture and oil absorbing properties that keep this Shea butter lotion recipe non-greasy and help bind all the ingredients together. But it doesn’t stop there! Did you know that cornstarch can also treat and soothe irritated skin, blisters, sores, bug bites and more?! 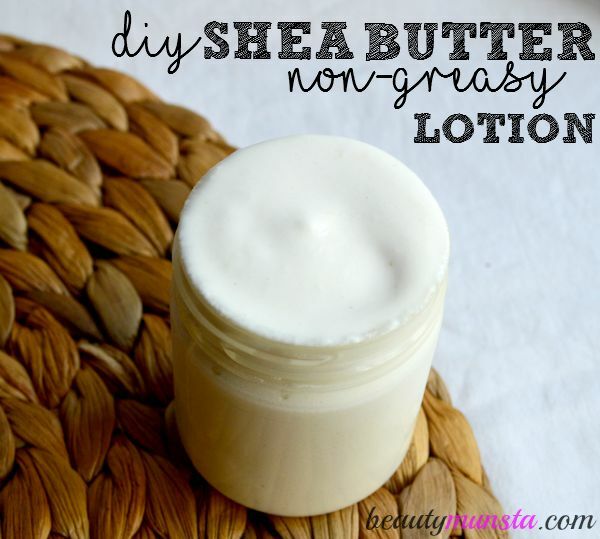 You’ve just gotta try this non-greasy Shea butter lotion recipe for silky skin! I used lavender hydrosol as one of the ingredients, to give it a smooth and easily absorbable consistency. Melt your shea butter over low to medium heat in a double boiler. I used a make-shift double boiler by placing a glass bowl of shea butter in a pan filled a couple of inches of water and heated it over a low flame till it melted. Once melted, place the shea butter in the refrigerator for 10 minutes and remove it when it is partly solidified. The reason we’re doing this is because completely melted shea butter can’t be whipped – it needs to be soft and creamy. After 10 minutes, get it out and add almond oil, apricot kernel oil and frankincense essential oil. Whip using a hand mixer/blender for about a minute or 2 till well mixed. Add the cornstarch and whip again for 5 minutes until you get a creamy white mixture. Then slowly keep adding the lavender hydrosol little by little while beating the mixture on low speed first, then high speed until fully incorporated. This may take around 5 minutes, depending on your hand mixer. Note: This is the most important step to getting your mixture to a liquid consistency. 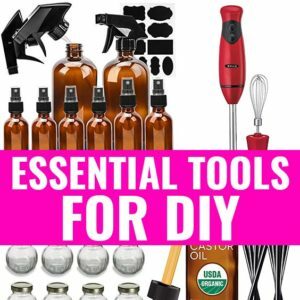 From my experience, do not pour the hydrosol all at once into the whipped mixture as I found that it just won’t mix well with the rest of the ingredients because oils and water cannot mix like that. The slow addition of the water and the speed blending is what helps incorporate the ingredients together. Ta-da! 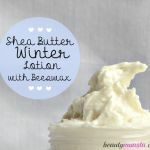 Your non-greasy shea butter lotion recipe is ready! Transfer it to a clean container. It takes just a little more than 25 minutes and it’ll last over 6 months if stored in a clean dry place and away from contamination. I like to stir in the essential oil after transferring the lotion to my container to prevent its overpowering scent from clinging to the bowl or mixer. If you don’t have a hand mixer, try blending everything in a food processor. 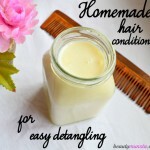 I’ve done it before with my other lotions like this shea butter hair lotion recipe and it works! Remember, the key to getting a homemade lotion liquidy is adding just the right amount of hydrosol and pouring it slowly in a constant stream into the melted oil mixture which is blending on high speed in the food processor. Both should be at the same temperature. Go to my post for detailed instructions! I’ve tried making shea body butter with a blender before but I had to be very precise to prevent everything from melting down due to the heat from the motor of the blender. Here’s the shea body butter recipe using a blender. You can substitute the lavender hydrosol with rose hydrosol or any other floral water. I recommend calendula hydrosol, chamomile hydrosol and neroli hydrosol because they are easily available and have lots of beauty benefits.